Vianne’s sister, Isabelle, is a rebellious eighteen-year-old girl, searching for purpose with all the reckless passion of youth. While thousands of Parisians march into the unknown terrors of war, she meets the compelling and mysterious Gäetan, a partisan who believes the French can fight the Nazis from within France, and she falls in love as only the young can...completely. When he betrays her, Isabelle races headlong into danger and joins the Resistance, never looking back or giving a thought to the real--and deadly--consequences. Review: Stunning. 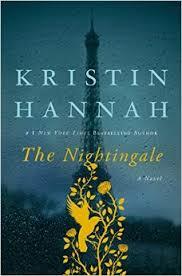 That is the first word that comes to mind when I think of 'The Nightingale', the first (and certainly not the last) book I've read by Kristin Hannah. I was drawn into Vivanne and Isabelle's stories from the first chapter and literally could not stop reading. I love a book that evokes emotion and I was absolutely riveted by their story. Hannah does a wonderful job showcasing the war from different points of view and I love how she handled the relationships between sisters, fathers and daughters as well as lovers. Isabelle was my absolute favorite character in this book. She evolves from a rebellious girl seeking her father's love to a key member of the resistance. Both story lines were heartbreaking and I found myself crying at several points of the book. Excellent. If you are a fan of historical fiction, read this.